Married Name 18 January 1927 As of 18 January 1927,her married name was Patzner. Clarissa E. Althaus was born on 27 December 1906. She was the daughter of Valentine Althaus and Theresa Flogel. Clarissa E. Althaus married Raymond Joseph Patzner, son of Alois Adolph Patzner and Tina B. Pluemer, on 18 January 1927 at Kieler, Grant, Wisconsin. Clarissa E. Althaus died on 24 September 1985 at Dubuque, Dubuque, Iowa, at age 78. 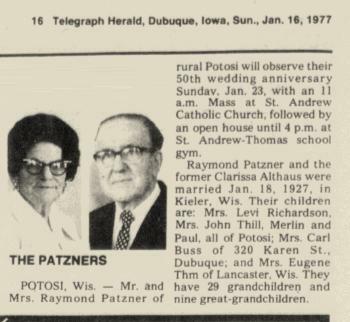 In January 1977 50th wedding anniversary of Raymond and Clarissa (Althaus) Patzner. Married Name Her married name was Patzner. Alberta M. Seng married Alfred Adolph Patzner, son of Alois Adolph Patzner and Tina B. Pluemer. Alberta M. Seng was born on 22 March 1921. She was the daughter of Leopold Seng and Mary Scanlan. Alberta M. Seng died on 8 November 2007 at age 86. Name Variation William Mechler was also known as Merkler. William Mechler was born on 11 June 1841 at Baltimore, Maryland. He was the son of Bernhardt Mechler and Bridget Arlet. William Mechler married Catherine Miller, daughter of Frances Miller and Margaret (? ), on 14 August 1862. In 1881 WILLIAM MECHLER, P. O. Potosi; saloon and grocery at St. Andrew's; shoemaker by trade; born in Baltimore, Md., June 11, 1841; son of Bernhardt and Bridget (Arlet) Mechler; came here in 1849. Married, in 1862, to Catharine, daughter of Frances and Margaret Miller; eight children, all living at home - Frank, Kate, Lizzie, Bennie, Annie, Maggie, Willie, George. 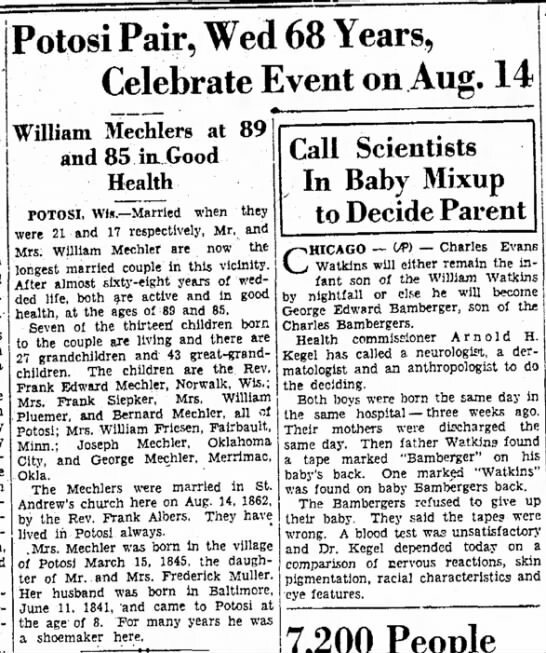 On 21 July 1930 William and Catherine Miller Mechler 68th wedding anniversary article The Capital Times (Madison, WI). Name Variation Catherine Miller was also known as Catherina Mueller. Married Name 14 August 1862 As of 14 August 1862,her married name was Mechler. Catherine Miller was born on 15 March 1845 at Wisconsin. She was the daughter of Frances Miller and Margaret (?). Catherine Miller married William Mechler, son of Bernhardt Mechler and Bridget Arlet, on 14 August 1862. Reverand Frank Edward Mechler was born circa 1863 at Wisconsin. He was the son of William Mechler and Catherine Miller. Married Name Her married name was Siepker. Name Variation Catherine Mechler was also known as Kate. 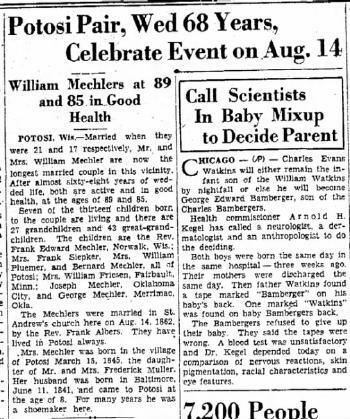 Catherine Mechler married Frank Siepker. Catherine Mechler was born circa 1864 at Wisconsin. Name Variation Elizabeth Mechler was also known as Lizzie. Elizabeth Mechler was born circa 1868 at Wisconsin. Name Variation Bernard Mechler was also known as Ben. Name Variation Bernard Mechler was also known as Machler. Name Variation Bernard Mechler was also known as Merkler. Name Variation Bernard Mechler was also known as Bernhard. Name Variation Bernard Mechler was also known as Bennie. Bernard Mechler was born on 22 April 1870 at Wisconsin also reported as Apr 1871. Bernard Mechler died on 7 June 1954 at Wisconsin at age 84. He was buried after 7 June 1954 at Saint Andrews Cemetery, Potosi, Grant, Wisconsin. 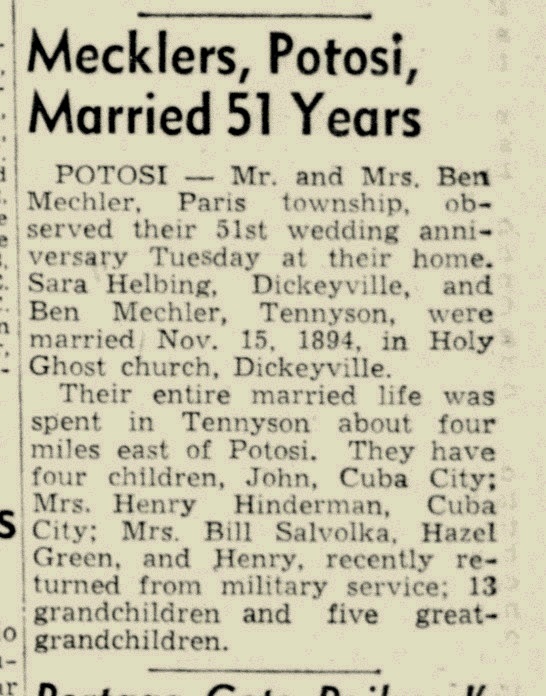 In November 1945 at Potosi, Grant, Wisconsin, Ben and Sarah (Helbing) Mechler 51st anniversary celebration. [S387] Family Search; Multiple Records, "Wisconsin, County Marriages, 1836-1911," database, FamilySearch (https://familysearch.org/ark:/61903/1:1:XRJD-DNM : 3 June 2016), John Helbing in entry for Bernard Merkler and Sara Helbing, 13 Nov 1874; citing , Grant, Wisconsin, United States, Wisconsin Historical Society, Madison; FHL microfilm 1,266,663. Name Variation Margaret Mechler was also known as Maggie. Margaret Mechler was born circa 1875 at Wisconsin. Name Variation William Mechler was also known as Willie. William Mechler was born circa 1877 at Wisconsin. George Mechler was born circa 1879 at Wisconsin. Francis Pluemer was born circa 1910 at Wisconsin. Roman Pluemer was born on 13 April 1913 at Wisconsin. Roman Pluemer died on 11 January 1973 at Chicago, Cook, Illinois, at age 59. Donald William Pluemer was born on 7 July 1919 at Wisconsin. Donald William Pluemer married Florence Mary Fure before 1942. Donald William Pluemer died on 3 June 1995 at age 75. Donald William Pluemer obtained US Social Security Card at Wisconsin; last residence Platteville, Grant, Wisconsin. On 3 February 1942 at U.S. World War II Army Enlistment, Milwaukee, Wisconsin, Name: Donald W Pluemer Birth Year: 1919 Race: White, citizen (White) Nativity State or Country: Wisconsin State: Wisconsin County or City: Grant Enlistment Date: 3 Feb 1942 Enlistment State: Wisconsin Enlistment City: Milwaukee Branch: Branch Immaterial - Warrant Officers, USA Branch Code: Branch Immaterial - Warrant Officers, USA Grade: Private Grade Code: Private Term of Enlistment: Enlistment for the duration of the War or other emergency, plus six months, subject to the discretion of the President or otherwise according to law Component: Army of the United States - includes the following: Voluntary enlistments effective December 8, 1941 and thereafter; One year enlistments of National Guardsman whose State enlistment expires while in the Federal Service; Officers appointed in the Army of Source: Civil Life Education: 4 years of high school Civil Occupation: Student, Chemical Engineering Marital Status: Married Height: 69 Weight: 170. Married Name before 1942 As of before 1942,her married name was Pluemer. Florence Mary Fure was born on 19 June 1918 at California. 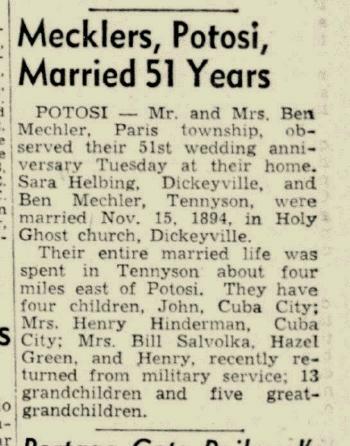 She married Donald William Pluemer, son of William Pluemer and Anna Rebecca Mechler, before 1942. Florence Mary Fure died on 2 April 2002 at Grant, Wisconsin, at age 83. Married Name Her married name was Muller. Stella Pluemer married Alfred A. Muller, son of August Muller and Kate (?). Stella Pluemer was born on 19 July 1900 at Wisconsin. She was the daughter of John Joseph Pluemer and Margaretha Gertrude Reuter. Stella Pluemer died in May 1975 at age 74. Leonard H. Pluemer was born on 4 January 1906 at Wisconsin. He was the son of John Joseph Pluemer and Margaretha Gertrude Reuter. Leonard H. Pluemer died on 16 June 1985 at Grant, Wisconsin, at age 79. [S250] U.S. Federal Census 1930 U.S. Federal Census, by Ancestry.com, Year: 1930; Census Place: Potosi, Grant, Wisconsin; Roll: 2574; Page: 5B; Image: 719.0; Family History Library Film: 2342308. Maynard E. Pluemer was born on 13 February 1909 at Wisconsin. Maynard E. Pluemer married Irene J. Slaats on 11 June 1929. Maynard E. Pluemer died on 27 October 1963 at age 54. Married Name Her married name was Fischer. Esther S. Pluemer married Hollis Fischer. Esther S. Pluemer was born on 29 April 1914 at Wisconsin. Esther S. Pluemer died on 6 June 1977 at Madison, Dane, Wisconsin, at age 63. Married Name Her married name was Pluemer. Pauline (?) married Peter H. Pluemer, son of Joseph J. Pluemer and (?) Stohlmeyer. Pauline (?) was born circa 1877 at Wisconsin. Mildred F. Pluemer was born on 11 February 1904 at Grant, Wisconsin. She was the daughter of Peter H. Pluemer and Pauline (?). Bernadine Pluemer was born circa 1908 at Wisconsin. Lucella Pluemer was born circa 1910 at Wisconsin. Albinus A. Pluemer was born on 2 February 1912 at Wisconsin. He was the son of Peter H. Pluemer and Pauline (?). As of March 1942, Albinus A. Pluemer was never married. He died on 6 December 2003 at age 91. Albinus A. Pluemer obtained US Social Security Card at Wisconsin; last residence Saint Augustine, Knox, Illinois. On 9 March 1942 at U.S. World War II Army Enlistment, Fort Sheridan, Illinois, Name: Albinus A Pluemer Birth Year: 1912 Race: White, citizen (White) Nativity State or Country: Wisconsin State: Wisconsin County or City: Grant Enlistment Date: 9 Mar 1942 Enlistment State: Illinois Enlistment City: Fort Sheridan Branch: Branch Immaterial - Warrant Officers, USA Branch Code: Branch Immaterial - Warrant Officers, USA Grade: Private Grade Code: Private Term of Enlistment: Enlistment for the duration of the War or other emergency, plus six months, subject to the discretion of the President or otherwise according to law Component: Selectees (Enlisted Men) Source: Civil Life Education: Grammar school Marital Status: Single, without dependents Height: 70 Weight: 165. Caroline Pluemer was born circa 1915 at Wisconsin. Madeline Pluemer was born circa 1916 at Wisconsin. Philbert J. Pluemer married Freda E. Muller, daughter of Phillip Muller and Elizabeth Holzer. Philbert J. Pluemer was born in 1919 at Wisconsin. Philbert J. Pluemer died in 1988. Freda E. Muller married Philbert J. Pluemer, son of Peter H. Pluemer and Pauline (?). Freda E. Muller was born in 1923. She was the daughter of Phillip Muller and Elizabeth Holzer. 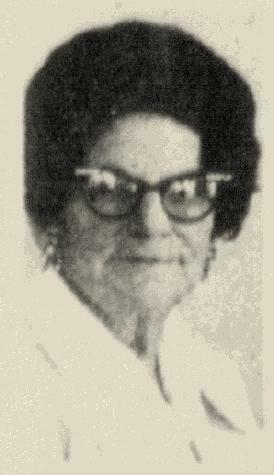 Freda E. Muller died in 1985. Married Name before 1867 As of before 1867,her married name was (?) Pluemer. (?) Stohlmeyer was born at Pennsylvania. She was the daughter of John Stohlmeyer and Mary A. Fecht. (?) Stohlmeyer married Joseph J. Pluemer before 1867. (?) Stohlmeyer died before 1874. Emmergine Pluemer was born circa 1902 at Wisconsin.